Why do I have it? I loved the first book, and was eager to see where the series was going. How long has it been on my TBR pile? Since 09 October 2012. Summary: Everett Singh is aboard the airship Everness, and still in control of the Infundibulum – the powerful computer that allows Everett to map anywhere in the multiverse. But the ruthless Charlotte Villiers and other members of the Order are still in hot pursuit, and they’ve got a new weapon: a parallel Everett. 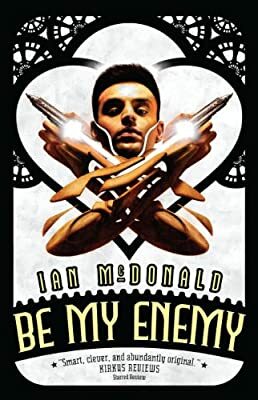 He’s been pulled from a world of advanced alien technology, had his very body has been turned into an armory, and who has been given a single task: kill the other you. Everett is smart and resourceful, but how can you defend yourself against someone who looks – and thinks – exactly like you? And even if the parallel Everett can be stopped, how will Everett be able to rescue his father, lost on one of the infinite number of parallel Earths? Sen unzipped the top of her Baltic suit and took out the Everness Tarot. She kissed the deck and then, with long-practiced ease, cut the deck one handed and turned up the top card. Two knights, one in black armor and one in white armor, faced each other with shields and spiked maces. Be My Enemy. Review: While this book had a lot of the elements that made me absolutely love Planesrunner – the non-stop action, the cool mishmash of genres and ideas, the interesting and subtly done interpersonal dynamics – in the final analysis, it didn’t quite draw me in the way first one did. Part of that was surely due to my state of mind when I read it but I think at least part of it had to do with the book itself. While this book has a good amount of worldbuilding – they visit the forbidden Earth 1 – it didn’t capture my imagination in the same way as the steampunky Earth that’s home to the crew of the Everness of the first book. This book also deals with a lot of interesting psychological quandaries, especially between Everett and his double, but I thought that meant that the secondary and tertiary characters didn’t get as much attention as they deserved. Even Everett’s budding relationship with Sen, while still well-done, felt like it was confined to relatively few scenes compared to Everett’s internal struggles and the extended action sequences. So, this series has a lot of really awesome things going for it. It is fast-paced and exciting and has a diverse protagonist and is very original and has people solving problems with science and plenty of airship chases and things exploding and parallel universe jumping. I didn’t think this installment was quite as strong as the first one, but it was good enough to keep me entertained, and definitely enough to make me want to see what happens in the next book in the series. 4 out of 5 stars. Recommendation: Not at all stand-alone, but the series as a whole should definitely appeal to fans of smart, quick-paced sci-fi. Other Reviews: The Haunting of Orchid Forsythia, The Intergalactic Academy, Val’s Random Comments, and more at the Book Blogs Search Engine. First Line: The car came out of nowhere. p. 14: “Sen was dressed in a clingy grey knitted top, ribbed tights, a pale fur gilet, and pixie boots and seemed perfectly comfortable in the freezing air.” – a waist- or hip-length garment, usually sleeveless, fastening up the front; sometimes made from a quilted fabric, and designed to be worn over a blouse, shirt, etc. This sounds good, but I don’t know about starting another series. I’ll add it to the list of possibles! Thanks for linking to the other reviews, too.